ALMOST one in three Queenslanders believe the Newman Government’s decision to switch from selling electricity assets to leasing them is a better option. A new Reachtel Poll, conducted exclusively for The Sunday Mail and Seven News, has revealed the support for the Government’s proposal to lease the power generation and distribution businesses. However, while 32.1 per cent of respondents were convinced the leases would make a practical difference, 41.6 per cent believed it would not be a better outcome for the state. The remaining 26.4 per cent were undecided. The results suggest the Newman Government still has a massive battle on its hands to convince Queenslanders about the key policy platform that it will take to next year’s election. About $37 billion worth of power and port assets will be sold to the private sector through leases of up to 99 years, under the so-called “Strong Choices” plan. Power generators Stanwell and CS Energy, distributors Energex and Ergon Energy and the ports of Gladstone and Townsville make up the bulk of the businesses to be sold off over five years. The Newman Government still has a massive battle on its hands to convince Queenslanders over its asset lease plan before next year’s election. The Government has sweetened the deal with $12 billion of the proceeds to be spent on infrastructure and removing the cost of the solar bonus scheme from household electricity bills. The remaining $25 billion would be used to reduce debt, putting the Government in line to reclaim an AAA credit rating. According to Reachtel, support for the switch to leasing assets was strongest among voters already committed to the LNP at 42.1 per cent. However, there was strong opposition among Labor, Greens and Palmer United Party supporters. The Government has been attempting to convince people that leasing the assets will allow it to retain greater control by setting conditions, particularly around prices and standards, as part of the agreements. Critics, including Labor and key unions, insist power privatisation will lead to high electricity bills regardless of the ownership structure. 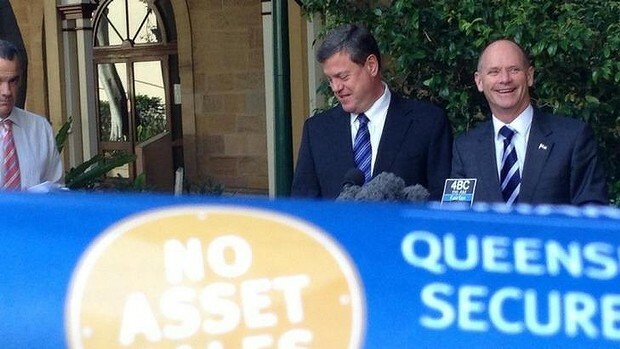 Independent and minor party MPs last week announced an alliance to oppose asset sales if they hold the balance of power after the next election, prompting criticism from Treasurer Tim Nicholls that their stance imperils up to 25,000 jobs. The Newman government could be in line to offer up some pre-election sweeteners after Liberal National Party MPs unanimously endorsed a plan to offer up state assets for long-term leases. All LNP MPs were called back to Brisbane on Tuesday to vote on the plan - finalised over the weekend - to lease state assets on 99-year contracts, following its endorsement earlier by cabinet. Premier Campbell Newman said the so-called Strong Choices plan would raise $37 billion, about $3.4 billion of which would go towards a "cost of living relief fund". Just what that fund would entail would be revealed at a later date, presumably prior to the 2015 election. "You'll have to wait and see," he said. "…It will be, we believe, and I'd like to be able to tell you more today, but it will be fiscally responsible." Mr Newman said the plan was unanimously endorsed "to the last man and woman" by the LNP party room. "Today, we say very clearly the assets are not for sale," he said. "The assets will be leased and we're able to deal with Labor's debt, create up to 25,000 new jobs, deliver $8.6 billion worth of infrastructure that this state needs and also make provision for $3.4 billion worth of cost of living relief. "It is a fantastic plan and one that has been reached after many months of consultation." Treasurer Tim Nicholls said he had travelled about 20,000 kilometres while consulting on the plan, offering up three options for debt reduction – increased taxes, decreased services or asset sales and leases. Mr Nicholls said state assets, such as ports, water distribution and electricity generators and networks, would be offered to the private sector on 50-year leases, with an option for a further 49 years if "strict conditions" were met. "We'll set out conditions in terms of things like maintenance of the networks, investment to meet growing needs throughout the state, expansion, meeting safety requirements, land access requirements, those sorts of things, so that the rights of people are preserved and protected through that agreement," he said. "In the event that there is a major breach of those conditions, then the government would have its rights to be able to cancel the lease or to step in. "Those are part and parcel of normal commercial negotiations." That did not convince Opposition Leader Annastacia Palaszczuk, who said the government was using "weasel words" to avoid the appearance of asset sales, which proved toxic to the Bligh government of which she was part. "This Premier has promised multiple times not to sell-off the state's electricity network, yet today's he's broken those promises and is pushing ahead with it," she said. "That means that Campbell Newman and every single one of his MPs is supporting higher electricity prices, more job losses, and less revenue to be spent on schools and hospitals. "This is the biggest asset sell-off in Queensland history and it will be mums and dads that pay the price." But Mr Nicholls said it was clear the Strong Choices plan did not amount to asset sales. "If you lease your house out for a year, you get it back at the end of the day," he said. "It's the same with these businesses as well. The underlying control will always sit with Queenslanders through the Queensland government and we'll be able to, as you do with all leases, see those assets returned back to the people of Queensland at the conclusion of the lease." But in 2010, as shadow treasurer, Mr Nicholls told State Parliament claims from the then-Labor government that the state would still own assets on 99-year leases were a "furphy". "As anyone would know if they had observed the privatisation of assets, a 99-year lease is as good as giving away the farm," he said on March 23, 2010. 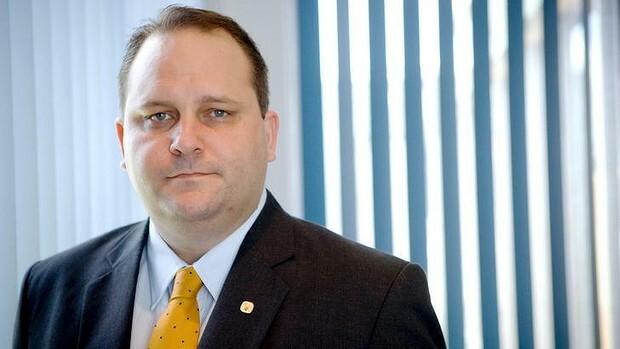 Former Redcliffe MP Scott Driscoll has been charged with 16 offences, including fraud and soliciting secret commissions. The Crime and Corruption Commission will allege his fraud offences involved $725,000, and he solicited at least $400,000 in secret commissions from two entities between August 2011 and May 2013. However the CCC will not allege Mr Driscoll ever received the secret commissions. The CCC said it would move ahead with two counts of solicitation of secret commissions, five counts of fraud and nine counts of fraudulent falsification of records. The 39-year-old will face Brisbane Magistrates Court on October 23. Russo Lawyers solicitor Emily O'Hagan would not comment on the allegations beyond confirming she was representing Mr Driscoll in the case. "I can confirm that I am the solicitor with carriage of his matter," she said. Mr Driscoll was referred to the-then Crime and Misconduct Commission over official misconduct claims at the end of 2012. He was suspended from the LNP over allegations of impropriety in March 2013. He quit the party and sat as an independent, but was frequently absent during the time the parliamentary Ethics Committee investigated his case. After the committee recommended his expulsion, he resigned and revealed he had been diagnosed with bipolar disorder. Mr Driscoll faced the Bar of the House on November 21 to answer 49 charges of contempt, but his then-lawyer Peter Russo spoke on his behalf. Labor's Yvette D'ath won the Redcliffe by-election with a 15.7 per cent swing on February 22, 2014. Premier Campbell Newman was asked on Tuesday afternoon if he was glad to see the matter come to a head. "All I can say is that the matter is now before the courts and I'm not going to comment any further," he said.